﻿ India's core inflation rate is easing, but RBI may not yet lower its guard. India's core inflation rate is easing, but RBI may not yet lower its guard. •	A relatively stubborn core inflation has stopped RBI from giving full support to growth impulses. •	That RBI has lowered its retail inflation forecast shows it expects core inflation to remain stable. The Reserve Bank of India (RBI) is clearly in an accommodative phase with two consecutive policy rate cuts. What stops the central bank, though, from giving full support to growth impulses through a change in its stance is core inflation. Core inflation renders the sharp drop in headline retail inflation less appealing. While headline retail inflation has dropped 1.85 percentage points in the last one year, core inflation has remained stable. In its latest monetary policy report, the central bank offers an explanation for the stubbornness of core inflation. 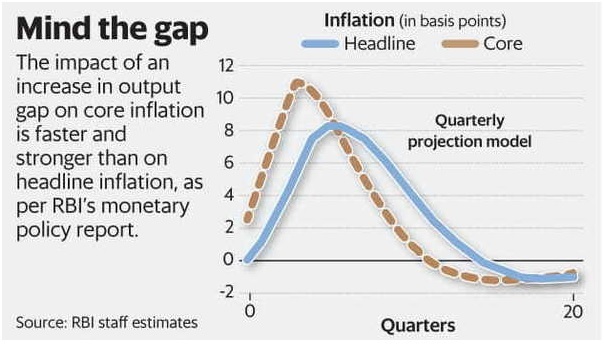 Using statistical analysis, it noted that the impact of a positive shock to the output gap has a stronger and faster push to core inflation than the headline figure. In other words, as economic activity picks up, the pressure on core inflation is more than overall inflation, and quicker too. The accompanying chart from the report shows how both core and headline inflation respond to a 100-basis-point shock to the output gap. What the chart also shows is that the effect also wanes faster on core inflation than on headline inflation. This, perhaps, explains the deceleration in core inflation in the last six-eight months. Shubhada Rao, chief economist at Yes Bank Ltd, notes that core inflation has eased sharply in the last six-eight months. “Given the momentum and the evidence of the last few months, it would seem that core inflation is trending towards the headline inflation and not the other way around," she said. The outlook for corporate earnings suggests that pricing power has yet to come back in a strong way in both manufacturing and services. The central bank’s study says that core inflation would surge if pricing power increases more than proportionally with the strengthening of economic activity. “The results suggest the need for monetary policy to be vigilant in times of large positive output gaps," said the RBI monetary policy report. Therefore, RBI may be reluctant to drop its vigilance over core inflation, but it has lowered its headline inflation forecast again this time. This suggests that the central bank expects core inflation to remain stable.